As the founder of the Animal Protection Union (União Protetora dos Animais), vegetarian Congressman Feliciano Filho has been a steady and powerful voice in São Paulo, Brazil, for our innocent, voiceless animal friends. A born animal lover, Feliciano has been an animal guardian since a very young age. His “career” as an animal advocate began with a visit to a local Zoonosis Control Centre in 2001. Deeply affected by the shocking conditions of the confined animals, he decided there and then that he would dedicate the rest of his life to those defenseless, tender beings. In answering the unspoken pleadings from some 150 animals there, he took immediate action and petitioned the Control Centre and the Department of Health to improve the conditions at the Centre and to cease the inhumane treatment of the animal residents. His determination and the power of love behind his action brought about changes within one day, including ending the practice of putting down animals in the Centre! He then went on to spend the next five years finding homes for the rescued animals, which eventually led to the establishment of the non-profit União Protetora dos Animais (The Animal Protection Union). The Union has since grown in strength and has saved and re-homed many thousands of gentle lives. His unwavering love for and dedication to our animal friends further led him to stand for public office where he could use political means to help improve their welfare. 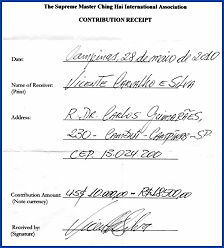 Within two years in office as the Campinas assemblyman, Mr. Filho had sponsored 25 animal-related legislative enactments; a world record. 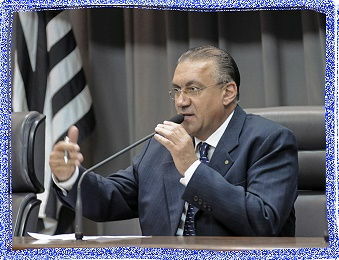 And atop these, he was later elected State Deputy and helped enact law 12.916 which forbids the putting down of cats and dogs in all Zoonosis Control Centers, municipal kennels, or similar facilities in the state of São Paulo. Mr. Filho is also the producer and host of the Animal Planet (Planeta Bicho), a TV series which shows animal rescues and features those kind-hearted caregivers who welcome the animals into their new homes. Throughout the program he attempts to raise public awareness on environmental issues and uses every opportunity to encourage people to become vegetarian. Given his credibility, many have chosen to move to this noble way of living. In recognition of his courageous, dedicated work and his outstanding achievement in animal protection as an enlightened political leader, Supreme Master Ching Hai granted Mr. Feliciano Filho the Shining World Leadership Award and a US$10,000 contribution. 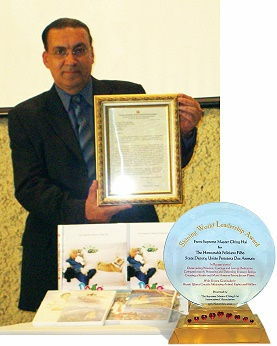 The Award ceremony took place on May 28, Golden Year 7 (2010), at the Tennis Club of Campinas where a vegetarian dinner for approximately 500 guests was held in joint commemoration of the 9th anniversary of the Animal Protection Union. With happiness and honor, Mr. Filho accepted the Award and sincerely thanked Master for Her recognition. He enthusiastically shared with our Association members his future projects including establishing special departments in police stations to investigate environmental crimes and mistreatment of animals. In expressing support for the plant-based lifestyle, he said that if one person becomes vegetarian after every lecture that he gives, he will be very happy indeed. We thank Congressman Feliciano Filho, a true champion, visionary and exemplary leader of our time for his heroic stand on behalf of the vulnerable and innocent animals. May God bless him and may many more be inspired by his admirable example to join the noble cause of creating a kinder and more humane future for our planet.